Are Big 10 Basketball Referees Biased Towards Winning Teams? Over the weekend Penn State men's basketball coach Pat Chambers had some strong words about a foul that went against his team in a 76-73 loss against Maryland. Chambers called it “The worst call I’ve ever seen in my entire life,” and he wasn’t alone in his thinking. Even sports media members with no affiliation to Penn State agreed with him. This wasn't the first time this season Chambers has criticized the referees. After a game against Michigan State, Chambers said he thought the teams and coaches affected how the referees called the end of close games. "At some point, this thing's got to stop, it's got to switch, I'm not a Hall of Fame coach," Chambers said. "Nothing against Tom (Izzo), nothing against John Beilein, nothing against all these other guys, but it's got to stop." This quote goes along the same thinking of the tweet by Dan Dakich. In a close game, will the refs be biased towards the more established coach or team? Now, I'm not saying the refs are having a secret meeting before the game, going "Okay, Michigan St is an elite program, if this game is close we need to make sure they win." But if you're a ref being yelled at by Tom Izzo/Bo Ryan/Thad Matta and on the other side is well, Pat Chambers, who are you going to listen to? One way to answer this question is to look at the outcome of close games. Specifically, games decided by 2 possessions or less or that go into overtime (and from here on out, I'll just refer to these as "close games"). We've previously seen that the outcome in close games is pretty random. In the long run, you'll win about half your close games and lose about half of them. However, if the referees are consistently making calls that go against you (or for you) it's possible that your winning percentage could deviate from .500. Since Pat Chambers has coached Penn State, they are 8-19 (.296) in close Big 10 games. And in close out-of-conference (OOC) games under Chambers (which are usually against traditionally weaker schools), they are 12-5 (.706). That's a huge difference! It's pretty easy to see why Chambers is so upset. However, we're dealing with some pretty small samples. So before we jump to any conclusions, we better increase our sample size. I collected data for every close Penn State game since 2002. I got my data from kenpom.com, which only goes back to 2002, which is why I choose that year. The following table has the results. We see that in 96 close Big 10 games, Penn State wasn't even able to win 40% of them! And if they were actually missing some sort of "clutch gene" (or whatever Skip Bayless would say) we would expect to see the same thing in their OOC games. However, they've actually won a majority of their close OCC games! Let's see if we can chalk this up to random variation. Assuming that their actual probability in close games is .500, what is the probability that Penn State would win 38 or fewer games in 96 tries? If their close games were truly random, the probability that Penn State would win 38 or fewer games is only 2.6%. That's low enough to conclude it didn't happen by chance. But if the reason is actually the refs giving preferential treatment to more established teams and coaches, we would expect to see similar results for other Big 10 teams. We see that Wisconsin, Michigan St, and Ohio State have been the premier Big 10 teams since 2002. And it's no surprise that they have 3 of the most established coaches in the conference with Bo Ryan, Tom Izzo, and Thad Matta. On the flip side, Iowa, Minnesota, Northwestern, and Penn State all have Big 10 winning percentages significantly under .500. And naturally, these four programs have been through a combined 12 different coaches since 2002. So if referees were biased towards winning programs, we would expect Wisconsin, Michigan St, and Ohio State to have won a higher percentage of close games at the expense of Iowa, Minnesota, Northwestern, and Penn St. But if there is no bias, we would expect each team to have a winning percentage close to .500. 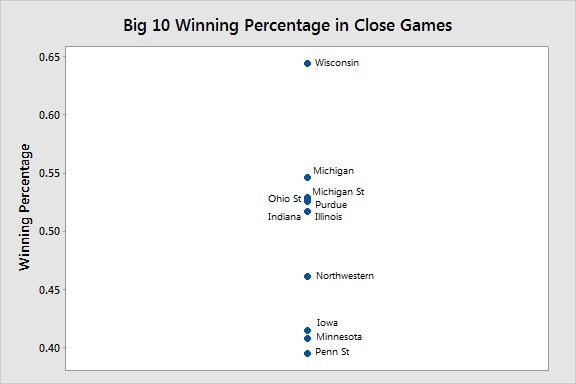 The following individual plot shows the percentage of close Big 10 games each team has won since 2002. The 4 perennial losers in the Big 10 also just happen to be the 4 teams that have had the worst "luck" in close games. But is it really bad luck, or could officiating be giving the benefit of the doubt to the more established team/coach? And if it's the latter, could Bo Ryan be the greatest referee manipulator ever? Wisconsin has won a ridiculous 56 of 87 close Big 10 games since 2002. 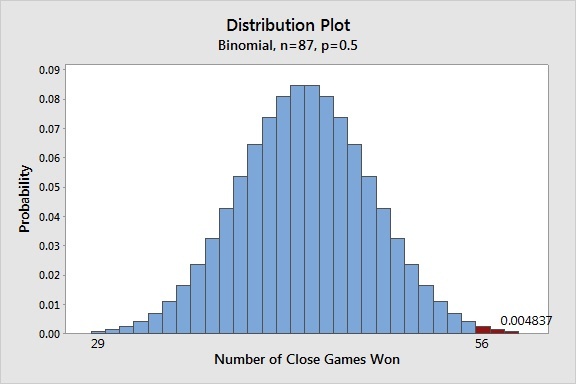 If you assume their true chance of winning a close game is .500, the probability that they would win 56 or more games in 87 tries is...well, it's low. That's less than half a percent! The chances of that are about 1 in 207! Is Wisconsin getting really, really lucky, or is something else going on? Granted, we should expect to see some variation in the distribution of the teams. If you take 11 different coins and flip each one 90 times, all 11 coins are not going to have heads come up 45 times. Wisconsin has an insanely high winning percentage in close games, but Michigan St and Ohio St have winning percentages right around .500. And Northwestern doesn't seem to have had as many close games go against them as Minnesota or Iowa, despite having a lower overall winning percentage than both teams. So let's break down the close games between only our top and bottom teams. After all, if the theory is that the established coaches/programs get calls over the perennial losers, we should look at games played specifically between those teams. So here are how the top 3 Big 10 teams have fared in close games against Penn St, Iowa, and Minnesota. And don't worry Northwestern, we'll get to you in a minute. Michigan State and Ohio State didn't have winning percentages significantly higher than .500 in close games when compared to the entire Big 10, but when you just look at games against the weaker teams, they both have winning percentages around .600. Total, our top 3 teams have won 45 out of 73 close games against Penn State, Minnesota, and Iowa. So is this significantly greater than .500? 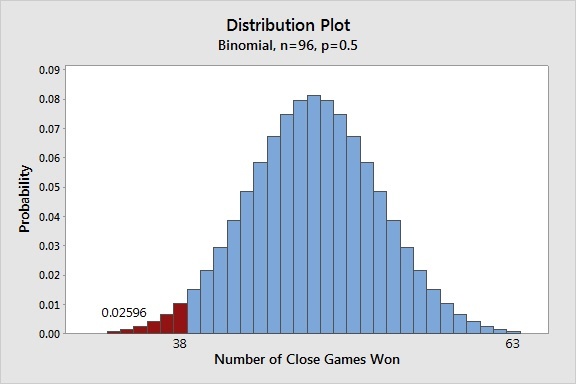 The p-value, which is 0.03, is lower than the common significance level of 0.05, which means we can conclude the top 3 teams win more than 50% of their close games against the bottom of the Big 10. There is definitely a decent case to be made that Big 10 referees give the favorable calls to the better team at the end of close games. If there is one Big 10 team associated with losing even more so than Penn State, it's Northwestern. Even though Penn State has a worse winning percentage in Big 10 games since 2002, the Nittany Lions have at least had some success. They won the NIT in 2009, made the NCAA tournament in 2011, and even reached the Sweet Sixteen in 2001. Meanwhile, Northwestern hasn't made the NCAA Tournament since..........well, ever. And yet they haven't fared poorly in close Big 10 games, winning 36 out of 78 (.462). Assuming their true chance of winning close games is .500, the probability of them winning 36 or fewer games out of 78 is 28.58%. That's not near uncommon enough to conclude its significantly lower than .500. So has Northwestern ruined our referee theory? Not at all. In fact, they're going to drive the final nail in the coffin. Remember how Michigan State and Ohio State didn't appear to win a higher percentage of their close games until we looked at how they fared against only the worst teams? Well Northwestern doesn't appear to lose a lower percentage of their close games.........until we only look at their games against the top 3 teams. Yep, that's Northwestern's record in close games against Wisconsin, Ohio State, and Michigan State since 2002. Two and thirteen! With a record that poor, I was sure I could find a game where the refs might have played a part. It took a 30 second internet search to find not one, but two. And in the same season! Coming into both games, Ohio State was ranked #1 in the country. They also had one of the best players in the country in Jared Sullinger. The first game was played at Northwestern, while the second was played at a neutral site during the Big 10 tournament. So you don't have to worry about ref biased due to home court advantage. So what happened during these two games? Sullinger had almost as many free throw attempts as the entire Northwestern team. Overall Ohio State had 52 free throws to Northwestern's 29. But even more astonishing than that is that 18 of Sullinger's attempts occurred during the final 5 minutes of the game or in overtime. Close game between Northwestern and the #1 ranked team with one of the best players in the country? It's no longer looking like much of a surprise which way the fouls went. When we add Northwestern's wins and losses to our previous table of the top teams versus the bottom teams, we get the following. When the top 3 teams in the Big 10 since 2002 have played a close game against the bottom 4 teams, they've won about 66% of the time. That's pretty B1G. So what do you think? Do refs actually favor established teams and coaches at the end of close games?